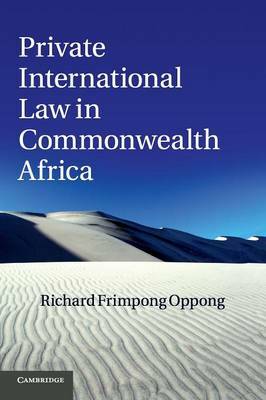 This book provides a comprehensive and comparative examination of private international law in Commonwealth Africa. It offers an unrivalled breadth of coverage in its examination of the law in Botswana, the Gambia, Ghana, Kenya, Lesotho, Malawi, Namibia, Nigeria, Sierra Leone, South Africa, Swaziland, Tanzania, Uganda, Zambia and Zimbabwe. The book is clearly and logically structured - it is organised around broad themes or issues, with country reports and accompanied by detailed commentaries. Drawing on nearly 1500 cases decided by courts in these countries and numerous national statutes, this book covers the four cornerstones of private international law: jurisdiction, choice of law, foreign judgements and arbitral awards enforcement, and international civil procedure. The author also provides an extensive bibliography of the literature on African private international law. Scholars and practitioners alike will find Private International Law in Commonwealth Africa invaluable and illuminating.